JANA OLIVER is an award-winning author who lives in Atlanta, GA. She’s happiest when she’s researching outlandish urban legends, wandering around old cemeteries and dreaming up new stories. This is such an amazing read! I didn’t want to put it down once I started it. There is always a point when you start to read books like this, ones that involve world building, the acceptance of creatures other than humans, and if the lead is strong enough to carry through a whole concept of saving the world. Riley provides just such a voice in this story where she doesn’t start out strong or knowledgeable. The story opens with Riley trying to catch a library fiend — a demon that is bent on destroying books and she takes control after a few missteps and gaffs. This is the first insight that Riley is just not an ordinary girl and that she may just have special gifts. I still don’t know if she has anything extraordinary going on, but I had that feeling throughout reading this first installment in the series. That and the demons called her by her name which turns out to be truly creepy and insightful but the reasons for this are not given in this book. I hope this will be developed in the next one. 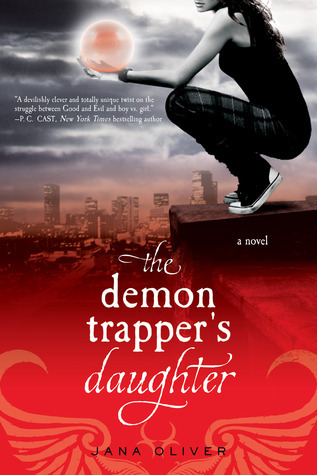 So Riley is trying to become a demon trapper, which in this world is a necessity and helps balance good and evil. Her father has her as his apprentice and just when Riley thought she was making progress a demon kills her father, which makes her an orphan. She is such a likable character that you will find yourself cheering for her as she figures things out and crying with her as her loss of family becomes apparent. She is now apprenticed to an unlikable character and he makes her miserable while Beck, her father’s previous apprentice tries to help her out. There is a mini love triangle starting here, although Riley doesn’t realize her previous crush on Beck still exists and develops an attraction to another apprentice Simon, who she describes as an angel. This is a wonderful dystopian tale that takes you to Atlanta in 2018 and will have you trying to solve the mystery of the holy water that no longer protects you from demons. Wow! Thanks! What a great review. This is a fine way to start a Thursday morning.